Items 267- out of displayed. 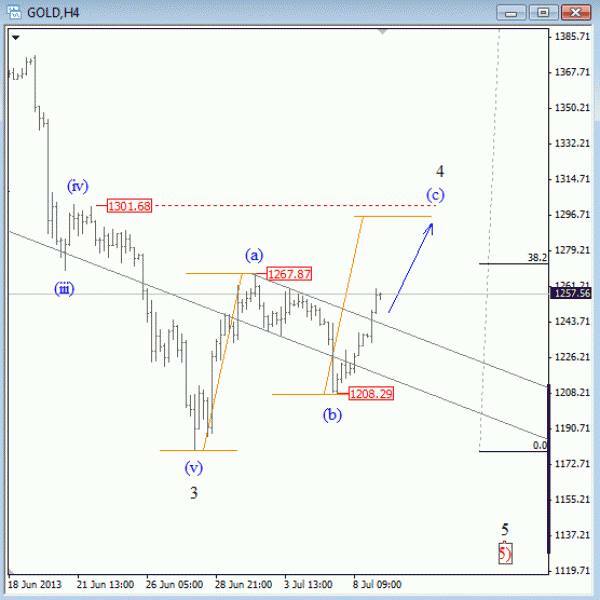 Gold was down on Friday after NFP report, but weakness did not last long as pull-back from 1267 was only wave (b), still only second leg of incomplete three wave rally from 1180. 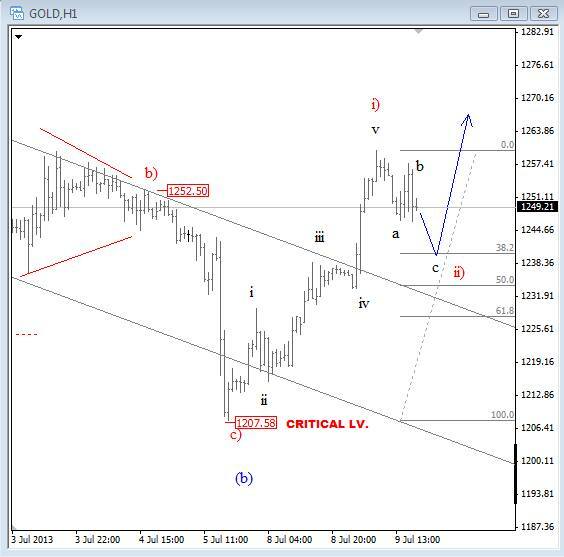 As you know we are tracking wave 4 that may reach 1280-1300 area before downtrend is back. 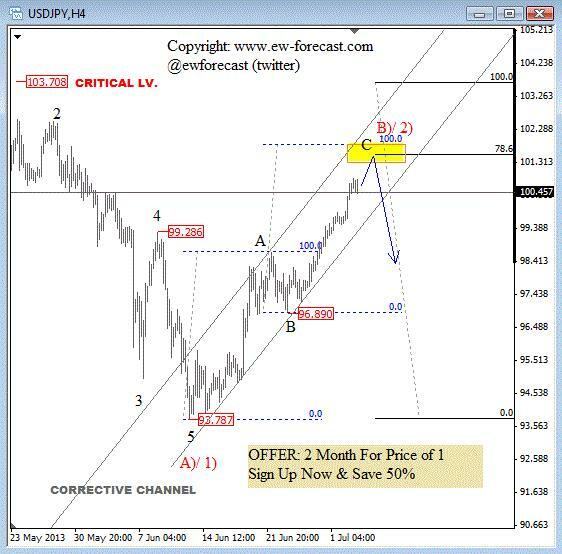 So for now, lets focus for higher prices within wave (c). On the intra-day chart GOLD is forming an intra-day pull-back from latest swing high which we think its correction within uptrend from 1207. Support for current three waves down comes in at 1240. EURUSD made three legs up from 1.2750 low to 1.3420 which we believe it was a corrective, contra-trend price action within a larger downtrend. We are talking about blue wave (2) which is showing signs of completion around 1.3420 level after sharp decline in the last three weeks with impulsive personality. Notice that pair is now already testing an important trend-line from October 2012 swing lows. Break here is expected which may cause a significant decline in the second part of this year. 30year US bonds are showing bearish pattern ahead of US NFP report. 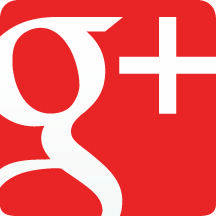 Can this be signal for good numbers today? If yes, then US bond prices will most likely fall on speculations that FED could start "tapering" QE later this year which would be supportive for USD based on latest correlations from latest FOMC meeting held on June 19th. In such case EUR could suffer the most because its the weakest right now. USDPY is trading higher and now forming much sharper and extended pull-back from 93.78 than previously thought. However, rise is still in three waves with wave C now approaching to important resistance area at 101.50-102.00 where we can see 78.6% retracement of wave A)/1) and as well as wave A=C level. As such, that’s very important zone for a possible turning point. But only impulse sell-off from here and back to 99.00 will confirm our bearish bias. EURUSD: You Must See These Charts!! Traders, please check our next video on EURUSD and why we think that pair may fall much lower in the next few days and even weeks. On EURUSD we can count three waves up from 1.2750 low which we believe it represents a corrective, contra-trend price action within a larger downtrend. We are talking about blue wave (2) which is now showing signs of completion around 1.3420 level after sharp decline last week which is impulsive move. As such, we expect further weakness in coming days and weeks, ideally back to April low. European stock market is sharply lower today following yesterday sell-off on US equities after Ben Bernanke who said yesterday that if the economy continues to improve, it could start to wind down its $85 billion a month asset-purchasing program towards the end of 2013 and end it in 2014. Metals are moving sharply lower, with gold testing now psychological level at $1300 and silver $20. We could see some technical bounce from here especially if we also consider Elliott Wave pattern which suggests that price is at the end of wave iii), now testing 261.8% Fibonacci support. As I know a lot of our clients were shorting gold since June 10. If you are one of them, then I suggest you to close some % and make very tight stops. E-mini S&P500 is also looking weak since yesterday where we can count now five waves down from latest high. This is impulse that confirms the change in trend; from bullish to bearish mode. EURUSD also extended its decline at the European open, which means that correlation between EURUSD and stocks are normal for now. USD is safe-haven in risk-off mode so normally traders will be interested in Long USD opportunities.